Gruiformes as a group are found on all the continents except Antarctica, although most gruiform families have a more limited distribution. The kagu is found exclusively on the island of New Caledonia, off the coast of Australia in the Pacific Ocean. Buttonquails are found in portions of Europe, Africa, Asia, and Australia. Mesites are found in Madagascar. Trumpeters are found in the Amazon basin in the northern part of South America. Seriemas are found in central and eastern South America. The sunbittern is found in Central America and South America. The limpkin is found in Central America and South America, as well as parts of Florida and Mexico. Bustards inhabit portions of Africa, southern Europe, south and Southeast Asia, New Guinea, and Australia. Sungrebes are found in Central America, South America, Africa, and south and Southeast Asia. Cranes are found on all continents except Antarctica and South America, although Asia and Africa are particularly rich in species. 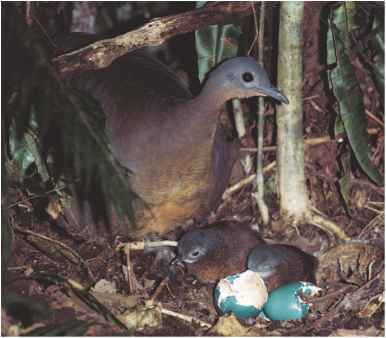 Rails, gallinules, and coots are also found worldwide.